Founder & CEO of Renegade, a recognized authority on cutting-edge marketing, & author of The CMO’s Periodic Table: A Renegade’s Guide to Marketing. ① HOW TO BECOME THE CMO OF YOUR CAREER | ② SECRET OF SOCIAL MEDIA SUCCESS | ③ RENEGADE THINKING | ④ IS THE ART OF MARKETING DEAD? We all recognize that marketing can be the difference between success and failure of a brand. In this inspiring and thought provoking presentation Neisser shows how to think about ourselves as brands and identifies the four traits of great marketers, offers numerous high-profile real-world examples of those traits in action and why these are essential to just about anyone who wants to push their career forward. Though just about every marketer recognizes the need to deploy social media only a few savvy practitioners are reaping the rewards. In this presentation, Neisser identifies the most common mistakes and shares mind boggling SNAFUs while offering a proven path to social media success. From strategy to execution, employee advocacy to influencer programs, customer service to community building, Neisser shares fascinating real world cases gleaned from his interviews with exceptional marketers like Audi, Converse, IBM, McDonald’s, NASA and SAP—examples that are sure to enlighten, inspire and entertain. Why do some marketing efforts go horribly wrong, while some are remarkably right? Renegade CEO Drew Neisser shares the requisite mindset, processes, and safeguards that improve the probability of a positive outcome. Bottom-line, you can consistently “bet the ranch” on the risky option and become a leader in the field. ④ Is the Art of Marketing Dead? Have the Data Geeks Won? Marketing is literally at war with itself right now as powerful data-driven tools like programmatic media, marketing automation and CRM hide the need for artful idea-driven marketing communications. In this presentation, Neisser will acknowledge the power of these new weapons while startling the audience with their limitations, proving that the spoils of war will still go the brands fueled by meaningful ideas. 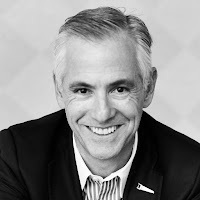 Drew Neisser, founder and CEO of Renegade, is a recognized authority on cutting-edge marketing techniques having won enumerable awards for creativity and campaign effectiveness. Part strategist, part ideator and part therapist, Drew is well known to numerous CMO’s as their secret weapon. Recognized among “50 Thought Leaders over 50” in 2014 & 2015 by Brand Quarterly, Drew is a prolific blogger for a long list of online publications including Forbes, FastCompany, SocialMediaToday, MediaPost, TheCMOclub, CMO.com and SmartBrief. A frequent speaker at a wide range of events, Drew’s been a featured expert on ABC’s Nightline and CNBC as well as The New York Times, Adweek and Digiday, among others. 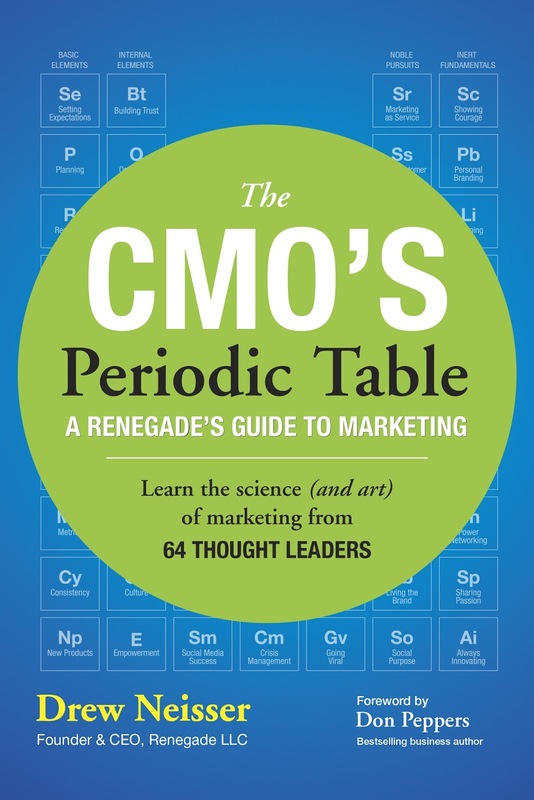 Through a long-time partnership with The CMO Club, Drew has met and interviewed well over 100 CMOs in the last five years for his articles and for his first book, The CMO’s Periodic Table: A Renegade’s Guide to Marketing. Drew is a trusted advisor to many of these CMOs and authors the highly praised CMO of the Week column for Social Media Today and TheCut, his coveted monthly newsletter. He regularly consults on digital and social media trends via the GLG network and currently sits on the boards of the Urban Green Council and Duke NY. In the last few years, Drew and his merry band of Renegades have crafted highly effective and award-winning “social inspired marketing” campaigns for a diverse group of clients including the Empire State Building, NCAA, RR Donnelley, Time Warner Cable Business Class, Cvent, MediaMath and HSBC among many others. A long-time champion of “Marketing as Service,” an approach that transforms traditional communications into programs that deliver genuine value to prospects and customers. The HSBC BankCab, an award-winning guerrilla program Drew conceived back in 2003 and delighted New Yorkers through 2014, is perhaps the quintessential example of this approach as it provides free rides (the service) to customers in an unforgettably ingratiating manner. Diapered at Wells Rich Greene, trained at JWT and retrained at Chiat/Day, Drew founded Renegade in 1996. He earned a BA in history from Duke University and lives in Manhattan with his wife, two kids and the agency’s mascot, a French bulldog named Pinky, A native Californian, Drew dreams of becoming a surfer but is a long way from hanging ten.